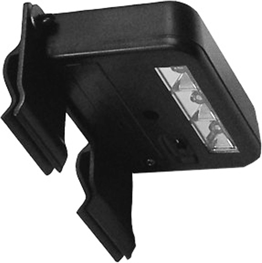 This solar sign light provides lighting for your security signs and deters intruders. The LED solar sign light collects and converts sunlight into DC power. The pre-installed, rechargeable battery stores energy to power the light all night long. A minimum quantity of 5 lights is required. 1. To maximize battery capacity, solar light should be fully charged by DIRECT sunlight for eight hours before initial use. 2. Be sure battery is securely contacted with the correct polarities. 3. Do not place solar light near a lighted object as the automatic on/off switch may not work properly. 4. Automatic on/off switch works properly only by outdoor DIRECT sunlight. 5. Solar panel surface must be kept clean to collect sunlight effectively. 6. The LED bulb installed inside the solar light normally lasts over 100,000 hours. 7. Under extreme cold temperatures, battery may not be fully charged. In such cases, solar light may not stay illuminated as long. 8. If you notice your light is blinking or dim, your light has not been charged properly. Move the light to a location where its solar panel is able to receive DIRECT sunlight to charge the light properly. How does the solar light work? The solar sign light must be placed outdoors. The built-in solar panel collects and converts sunlight into DC power every day while the pre-installed rechargeable battery stores the energy to power the light at night. The built-in sensor automatically activates the light at dusk and deactivates it at dawn. How long does the security sign light illuminate? It depends on the seasonal sunlight availability in your geographical area under certain weather conditions. Stronger or longer sunlight hours enable battery to store more energy, which provides more lighting hours. Weaker or shorter sunlight hours reduce the lighting hours. This solar sign light system is designed to work properly with enough reserved power in the rechargeable battery. The power could be overdrawn if solar light remains on during weather conditions that won’t allow the system is to recharge energy for a day or two. When the allows for direct sunlight, the security sign light should be turned off and left to charge for at least 3 days before reactivation. This will help restore the battery with reserved power. The solar sign light should return to normal operation and hold power. You may also deactivate the solar sign light during poor weather conditions. This may prevent the power from being overdrawn. How to set-up your Solar Light onto a Sign? Step 3: Clip light onto sign. Note: Not every sign shape can hold a solar light, shapes such as Badges and some Shields are not recommended. Other shapes like squares, rectangles, octagons and circles will work perfectly well. Step 4: Install sign with affixed light in outdoor area with direct sunlight. Light will charge during the day and illuminate at night, turning on automatically. When and how to replace battery? The pre-installed battery normally lasts about 36 months. You may need to replace battery when solar light stops working. Use Nickel Metal-Hydride rechargeable AAA battery (1.2V 600mAh or higher mAh) to replace the old battery. Follow the illustration to replace battery. Remember to securely re-assemble the solar light after replacing battery.